4 Bed, 3 Bath Villa at Lake Wilson Preserve, Davenport. Games Room and Private Pool overlooking conservation area. Sleeps 8 to 10 people. 12 minutes from Disney. 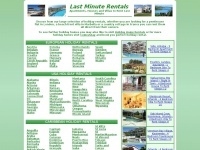 Holidaylettings.co.uk - Holi­day­Let­tings: The Best Holi­day Ren­tals, Apartment & ..